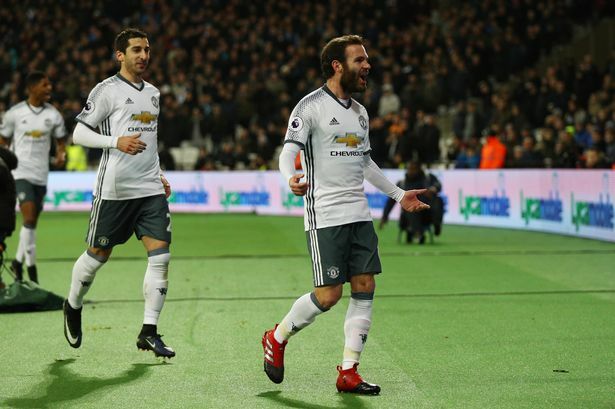 After the dramatic nature of our late, harum scrum win over Middlesbrough on New Year's Eve, United found another way to win at West Ham. On our first ever visit to the London Stadium (formerly known as the Olympic stadium), United were abetted hugely by the controversial dismissal of Sofiane Feghouli after 15 minutes. The Reds eventually overhauled Slaven Bilic's brave and resilient outfit - who performed admirably with ten men - to earn a seventh successive win. We're now unbeaten in our last 13 games across all competitions - our best run since SAF retired - and we've picked up 25 points from a possible 33. It wasn't United at their best level but the momentum of a six-game winning league run can be enough to get you points on a below-par day. This was far from vintage United - indeed it was one of our poorer performances in that run - but we stayed patient and eventually got the job done in a diligent and professional manner. Gone was the high tempo, edge-of-your-seat creative attacking play that proved the backbone of that winning run and was prevalent in the Middlesbrough drama. United reflected the London Stadium atmosphere with a flat and lifeless first-half performance that was an unwelcome throwback to the nadir of LVG's ill-fated tenure. Jose's tactical nous and acumen hit overdrive during half-time, and a large chunk of the credit should go his way for his proactive and game-changing substitutions. He introduced Juan Mata for Matteo Darmian, as United went three at the back before Jesse Lingard and Henrikh Mkhitaryan switched sides and Marcus Rashford came on for Lingard. Michael Carrick was rested against Boro and returned to the base of United's midfield against the Hammers as United continued their incredible win percentage whenever the peerless playmaker is in the team. Mourinho's master-stroke paid off when super-subs Mata and Rashford linked up as the latter picked out the former to sweep their side in front shortly after the hour mark. Mata set up the winner against Boro and again made the difference here: his penchant of creating game-changing moments in tight situations surely puts him in contention for the club's player of the season crown. Mourinho has made a career of substance over style - and 'winning ugly' but, in these past two games, his side have shown that they are capable of both.